Question: How accurate are offset and tie measurements? 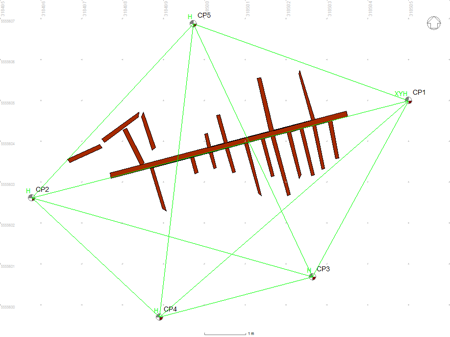 To answer this question the same detail survey points were positioned using offset, tie and 3D trilateration measurements. The trilateration measurements were used as a standard to compare the other methods with as the quality of points positioned using trilateration can be calculated. The precision of offset measurements may be dependent on the length of the mesurement so for the first test the distances were kept less than 1.5 metres to assess the quality over short distances. 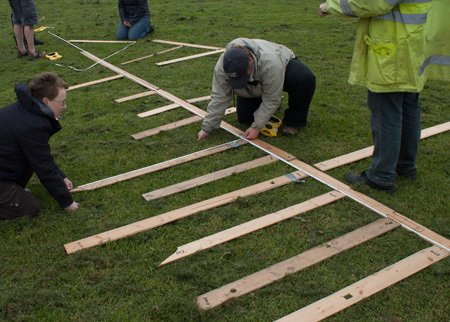 This test was done during fieldwork training for MA maritime archaeology students from the University of Bristol. 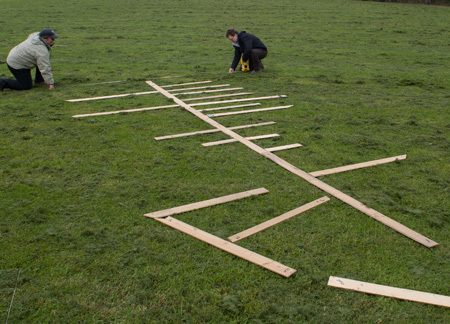 Five tent pegs were used for the contol points CP1-5 making a CP network 9.6m by 6.9m laid out on a flat area of grass. The detail points to be positioned were marks made on the timbers of the mock shipwreck site used for training. Standard builder's fibreglass tape measures were used for the distance measurements and heights were obtained from a dumpy level with an estimated measurement error of 10mm. The ten direct distances were measured between the five control points and five height measurements were recorded with the dumpy level (Figs. 1, 3). 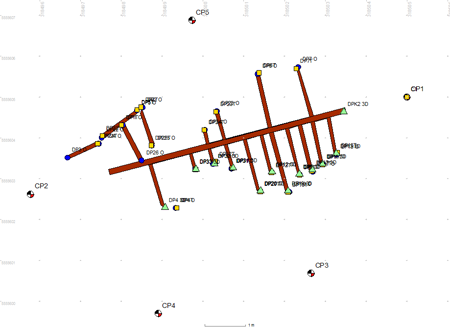 Eleven detail points on the site were positioned using trilateration with four direct distance measurements plus a height from the dumpy level (Fig. 4). The same detail points plus others were then positioned using offset measurements from the 9.5m long baseline between CP1 and CP2, the right angle at the baseline was estimated in the usual way by swinging the tape until a minimum distance was recorded (Figs 2, 5). Ties measurements were also used to position each detail point ensuring the angle between tapes at the detail point was 60-90 degrees (Fig. 6). The measurements were designed to be typical for this kind of work, they were recorded by students under training who were not aware at the time that this comparison test was being done. 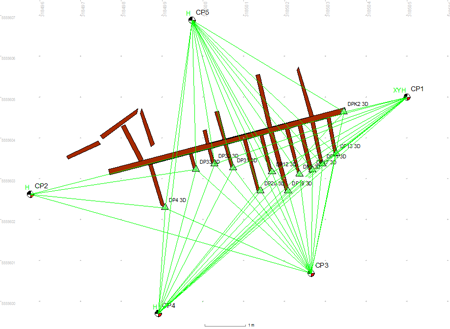 After adjustment the RMS of residuals for the CP network measurements was 2mm, a good result typical of what can be expected from a very small CP network measured on land under ideal conditions. The same RMS was achieved for the 11 detail points positioned using trilateration so the positions for all of the points were considered reliable. 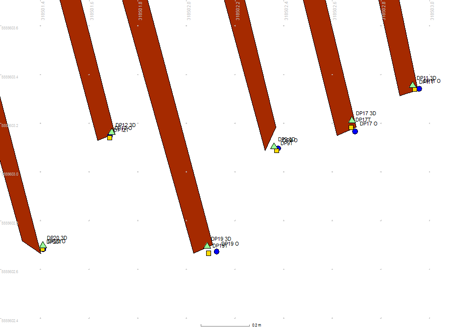 The plotted positions of the offset and ties measurements are shown below in figures5 and 6. The comparison between the three sets of detail point positions can be seen in figures 7 and 8. The horizontal (XY axes) positions of the survey points were compared as offsets and ties methods produce positions in two dimensions only. Any slope in the baseline CP1-CP2 was accounted for in post-processing by Site Recorder as the heights of the two control points had been measured with a dumpy level and included in the adjustment. The table below shoes the differences in positions of the offset and ties measurements compared to the position computed using 3D trilateration. The Distance value is the distance from the positioned detail point to the baseline. The Radial error value is the distance from the trilateration position to the offset or tie position; ideally this value should be as small as possible. The dX and dY values are the radial value expressed as errors in the two axis directions. The average value of the radial errors is shown at the bottom of the table for both offset and tie measurements. Detail point DP4 was positioned using offset and ties but the values differed from the trilateration position by 263mm. This appears to be a mistake probably caused by movement of the detail point between measurement sets so the measurements have not been included in the table below. The difference in positions for the offset measurement compared to trilateration vary between 13mm and 47mm with an average of 27mm. For ties measurements the minimim difference is 11mm, the maximum 56mm and the average again 26mm, but the 56mm difference is larger than the others so could be caused by a mistake in recording. At the short distances the position errors for both offset and tie measurements were similar at 27mm and 26mm. This matches well with the measurement error calculated for a single distance measurement made with a fibreglass tape measure.